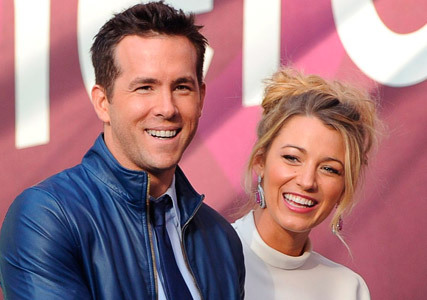 Ryan Reynolds has been revealing details of his marriage to Blake Lively, saying that he would never dream of stepping out in public without getting fashion advice from his wife. And very wise Reynolds is. Blake Lively is one of the most stylish celebrities around, regularly topping best dressed lists and wowing on red carpets across the globe. Blake, herself, famously doesn’t have a stylist, something which is very unusual in the world of Hollywood. Speaking at the Met Costume Institute Gala in May, Blake said that the only people she asks for style advice are Karl Lagerfeld and Christian Louboutin. Last night, the Gossip Girl star gave a speech in Shanghai at a black tie event to promote new fragrance Gucci Premiere. She looked predictably stylish in a bronze metallic dress by, you guessed it, Gucci. The starlet accesorised the strapless number with a chunky chain-link statement necklace. Earlier in the week, the 25-year-old was spotted in Barcelona with husband Ryan Reynolds as he promoted his latest movie, Turbo.